After you take your vehicle off the lot and are excitedly driving around town, have some comfort that you will always have Thomasville Toyota for your automotive maintenance! We make it easy to to schedule your next appointment with our expert service technicians. It does not matter if you are looking to have an oil change, tire inspection or replacement, or a battery check. With the famous ToyotaCare package, your next service may just be that much easier. Give us a call today, and we can offer you the run down on how you can save big money at Thomasville Toyota! My experience was very pleasant and professional. The service representative was courteous and thoughtful. I waited a little longer for my car but it was not a overkill. Thanks for your professionalism. I was in for my passenger door handle, inside door. Parts department ordered the wrong one so I had to make two trips for the same problem, in which I did not have the time for.This was an inconvenience making two trips for the same problem. This is the only dealership that wanted to help me purchase a care. I was treated with respect and was given a good deal on the purchase and trade. The service was great and they change my oil at a decent speed well I was in and out less than 45 minutes. First time at the dealership. Happy with the speed of the deal and if course the vehicle. Very happy and will show there again. Nice facilities! The staff at Tomasville Toyota goes above and beyond to take care of the customer. They perform excellent work, very courteous and friendly. I would never go to another Toyota dealership. They treat you like family and appreciate the customer's business. You have just got to check out all of the latest Toyota cars, trucks, and SUVs at Thomasville Toyota. We have the Prius, Corolla, Tacoma, Tundra, RAV4, Corolla, Camry, Yaris, and more all at one convenient location. We offer these vehicles in new, used or lease options for greater flexibility in choice. We know that we can often have a dizzying amount of options on our cars. That is why our team is trained and experienced at guiding our customers through the maze of choices to find them the car that makes sense for their situation. Not everyone needs the same vehicle, and we have something for anybody. So no matter if you work in construction, a kitchen, an office, or at home, give Thomasville Toyota a call today for all of your Toyota needs. At Thomasville Toyota, we make it simple to get your vehicle financed from one of the many credit agents in Thomasville, GA. All you have to do is head on over to our Credit Application site and submit your basic information to our encrypted server. We can then find you a loan before you even come to our dealership. If you would prefer to talk to one of our experienced financial experts, give our Finance Department a call today. We cannot wait for you to stop by our dealership for a test drive on all of our great products. If you have any questions, do not hesitate to call us! 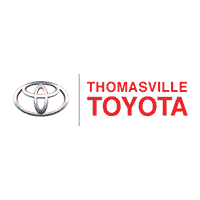 We cannot wait to see you at Thomasville Toyota in Thomasville, GA.